The January Siren is now online. 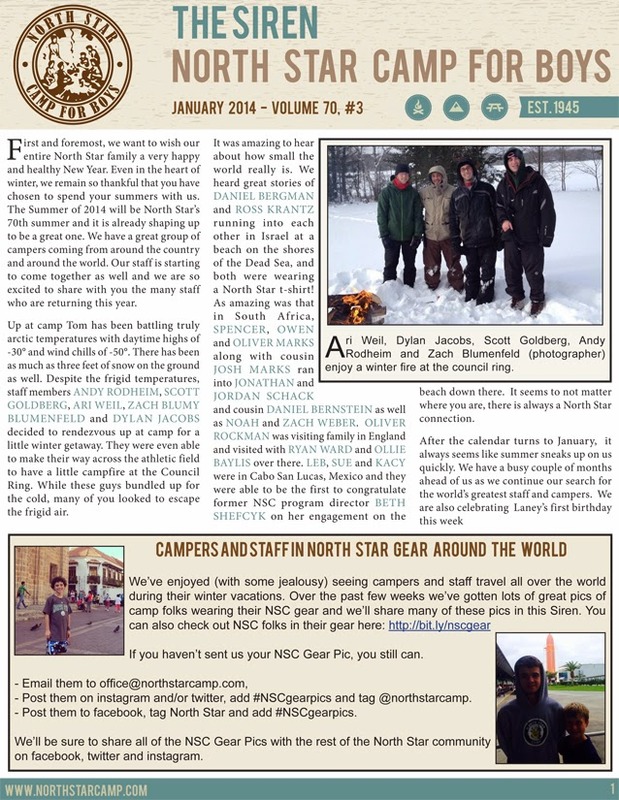 The new year is off to a great for camp and we’ve got lots of news to keep you warm through any Polar Vortex you may be facing these days. The Siren is filled with information on returning staff, new and returning campers, and great small world stories as well. Enrollment continues to be strong, and you’ll see the latest new and returning campers who have enrolled. We still have spaces remaining in some of our age groups, depending on session. If you know of anyone who might be interested in sending their son to North Star, let us know by completing the “Refer a Friend” form. We will be at camper recruitment events in St. Louis, Dallas and Nashville over the coming weeks and maybe more. We’d be happy to schedule home visits with prospective campers. As always, we appreciate your support and we know that our best salesmen and saleswomen are our camp families. This entry was posted in Uncategorized on January 27, 2014 by Andy Shlensky.